In this paper short reviue about the most important Macedonian foundry companies is given. During prepariation of this work autors visited production units of of the foundry companies and discused with their menegament about the most important things concerning their current work and the plans for the future. It was found that six of the companies are the most important for Macedonian industry. All of them are private companies. They are founded before transition period, and their production is mainly intended for the foreign market. It is important to say that they have very ambitious plans for improvement of technological processes and increase of production. Cast zinc alloys are widely used in various industries of national economics, including the manufacturing of products for tribotechnical applications. There are such approaches to solving the problem of improving the tribotechnical characteristics of zinc alloys, as the search for new alloy compositions and optimization of existing ones. However, the capabilities of traditional alloys to achieve the desired properties of products that meet the growing demands almost exhausted at present time. One of the most effective ways to improve the tribotechnical properties of zinc alloys is realization of the principle of reinforced heterophase structure, which is the basis of creation of composite alloys. This paper presents creep buckling finite element modeling of steel beam-type structure. For beams under sustained loads the loss of stability may occur during a period of exploitation of structure even for loads lower than critical buckling load. For that reason stability is characterized by critical buckling time instead the critical buckling load. The simulation is performed using four nodded Kirchoff- Love theory based shell finite elements. For a space frame, as the test example, critical buckling times are calculated for different levels of applied load, temperature conditions and steel chemical composition. The paper presents the results of developmental researches related to determining the influence of application of various systems for LPG on vehicle properties. On model Florida Zastava the following sequential systems were installed: Sequent 24 BRC, Omegas LR, e-G@S, Fast Lovato and Alisei N Zavoli. The results of comparative investigations obtained indicate the advantages of particular systems. The results of individual adjustment have been compared with the results of a production vehicle adjustment. model of charging and discharging of the battery is validated experimentally with a traction battery used in EV / HEV. An interesting feature of this model is the simplicity for extracting of the dynamic parameters of technical specifications of the battery. Only two points on the curve for the discharge of the battery in the steady state are required to obtain the necessary parameters. The model of the battery is included in the simulation using the LabJack U12 in the programming environment LabVIEW2012 for EV / HEV applications. The results show that the model can accurately represent the dynamic behavior of the battery during use of EV / HEV vehicles. In current work is made comparison between the differences in structure methods of propulsion and price of two types of motors with permanent magnets and AC drive (PMAC). PMAC is common name of electric motors – permanent magnets synchronous motor (PMSM) and brushless permanent magnet motor (BLDC). On the basis of comparative studies is selected and tested construction and propulsion of low-cost BLDC motor, suitable for hybrid transmission of HEV. 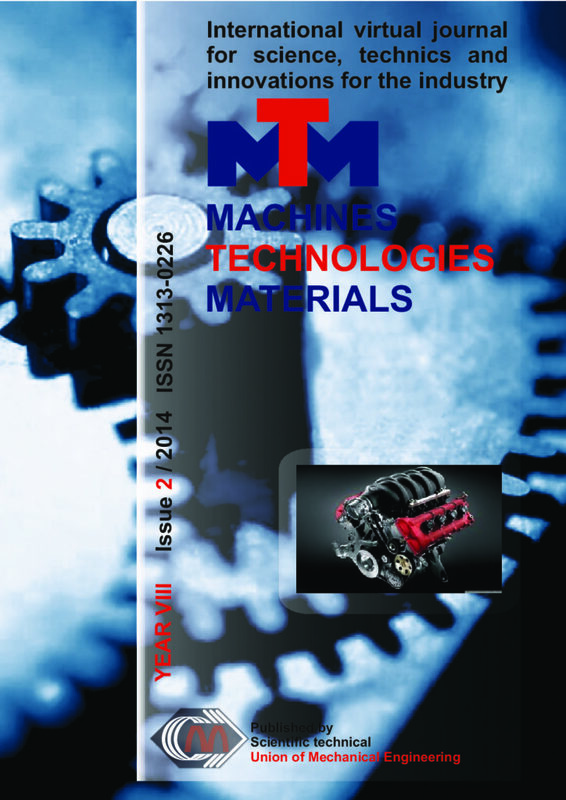 The paper is focused on the analysis of tracked vehicle propulsion mechanism during a movement of the vehicle. Propulsion mechanisms of tracked vehicles are highly loaded by dynamics stress. This stress arises by vehicle movement on a terrain and by vibration of tracks. Analysis of this stress is essential in the process of development or optimization (modernization) of the vehicle. Simulating technology was chosen for analysis of selected vehicle, because analysis of propulsion mechanism stress of tracked vehicle is complex process. Utilization of simulating technologies enables extensive analysis of vehicle behaviour including analysis of stress of main parts of the vehicle. Multicopters are widely used in a professional manner today in film industry, military applications etc. These vehicles are easy to build which have mechanical and electrical parts. Also autopilots are being sold to control these vehicles. However, mostly these vehicles are being built and used with little knowladge about the system dynamics, performance and stability. Mostly wrong propeller motor battery combinations are used. And mostly these vehicles are being used by different payloads. Every change in payload changes dynamics and stability of the vehicle. Very little of users are eligible at PID tuning and increasing the stability of multirotor vehicles. We aim to provide a test platform and methodoly for system identification and increasing stability of Multirotor Vehicles. This paper presents the analysis which is based on the parameters of the real device for producing a mixture of hydroxyl (HHO) and similar parameters to the real 2.0 SDI VW Golf MK V engine. Theoretical analysis has been made to principles of cooperation the engine with HHO’s generator. The effects of the gas on the engine and operating economy were established. The analysis was divided into quantitative and qualitative. Quantitative analysis was contained the theoretical and economic calculation of the thermodynamic cycle taking into account the HHO gas. Qualitative analysis was concerned to the quality of combustion in the engine and the impact generator HHO to the quality of the combustion.